To Bramora on the "Ships starting with B" page. Tonnage: 6361 gt, 9560 tdwt. Built by Eriksbergs Mekaniske Verkstads A/B, Gothenburg, Sweden in 1928. 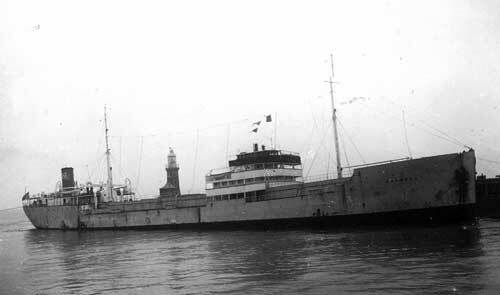 I've been told, via E-mail from Jan Goedhart, Holland (who in turn received the information from the Swedish Maritime Museum) that she had the name Markland when built (Skibs-A/S Markland, Bergen), and was renamed Bramora when purchased by A/S Bramora (Ludv. G. Braathen), Oslo at the end of 1936. See also the external page that I've linked to above. (This earlier name is not mentioned by R.W. Jordan's "The World's Merchant Fleets 1939). Guestbook message - From a relative of one of Bramora's casualties, Kenneth Brown. Sept. 7 Port Lincoln Palembang Sept. 22 Independent Page 1 gives departure Adelaide Sept. 5. May have been BP 67B. Apr. 8 Bandar Abbas Abadan Apr. 10 Independent (Stop at Bandar Abbas not mentioned, Page 2). May 19 Durban   DN 40 Dispersed May 21. Aug. 6 Durban   DN 55 Dispersed Aug. 9. Sept. 6 Bandar Abbas   PA 52 Detached Sept. 8. According to Page 1 of the archive documents, Bramora was in Melbourne when war broke out in Norway on Apr. 9-1940. Her 1941 voyages also start on this document, while Page 2 shows her 1942 voyages and 1943 voyages. It'll be noticed that she had some long stays in Melbourne. She had arrived there from Bahrein on Sept. 20-1940; departure is given as Febr. 20-1941, when she proceeded to Palembang. She also spent quite a long time in Melbourne in 1942, having arrived on Febr. 13, departing again for Abadan on Apr. 5. At the end of that year, she spent a long time in Bombay, where she had arrived Nov. 29-1942. She did not leave until Febr. 3-1943. Also, she spent 2 months in Durban in the summer of 1943 - the reason for these long stays is unknown. In Convoy PB 13 - Havkong. In Convoy BP 67A - Europe. In Convoy BP 67B - Belpareil and Bust. In Convoy PA 28 - Ima, Peik and Storaas. In Convoy DN 40 - Tricolor. For more information on them, please see the alphabet index at the end of this page, or go to the Master Ship Index. Bramora disappeared in Sept.-1943, when on a voyage from Bandar Abbas with oil for Melbourne, having left Bandar Abbas on Sept. 6 - see Page 3. According to A. Hague, she had joined Convoy PA 52, but had been detached on Sept. 8. She's believed to have been torpedoed southwest of the Chagos islands on Sept. 14, 06 10N 67 37E, by the same Japanese submarine that had attacked Alcides in July that year, namely I-10 (Tonozuka) - follow the link for details. Another war crime is suspected in this case (most of the men from Alcides had been shot). D/S Storviken was the next Norwegian victim of I-10. See also Anna Knudsen. * 1st Mate James Jørgensen was the cousin of Otto K. Jørgensen, who managed to escape from Duala while interned. The date is given as Sept. 18-1943 for all of these men, except D. L. Ross, who is said to have died on Aug. 19-1943 (this must be an error). One of the Chinese crew members, Wee Fong Han, is commemorated at the Hong Kong War Memorial, details on him can also be found at the Commonwealth War Graves Comm. website - date is given as Sept. 19-1943. Additionally, I found a Harold Blanchford, Alberto d'Annunzio, Ronald Toyer and a George Wright listed for this date, though can't be 100% sure that these are the same men. All these links are external. See also this page in my Survivors & Fatalities section. Back to Bramora on the "Ships starting with B" page. 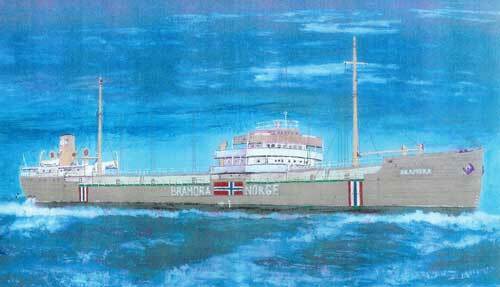 After the war, the Norwegian tanker M/T Erling Brøvig was renamed Bramora and sailed for a number of years under that name. The text on this page was compiled with the help of: "Nortraships flåte", J. R. Hegland, "Sjøforklaringer fra 2. verdenskrig", Volume I (Norwegian Maritime Museum) and misc. - ref My sources.